Today I'm sharing a quick & easy recipe that I tossed together one day. It was one of those days where I felt like we had nothing in the fridge... But, with a few simple ingredients, I was still able to put these little guys together. They made the perfect lunch, but would also be a great appetizer or salad topper, even! I know sardines have a reputation for being sort of "icky" to most people (I used to feel the same). Do them up right, however, and they're a tasty dose of protein, Vitamin B12, and omega-3 fats. I hope you enjoy these crispy, savory bites as much as I did! Don't forget to pick up some coconut aminos for dipping-- it adds the perfect amount of slightly sweet flavor! Whisk one egg in a medium bowl. Add the sardines, garlic, spinach, and coconut flour and stir with a fork to combine. Scoop out the mixture into 1/4 cup portions, and shape as you like. I made a ball shape, then flattened them slightly. 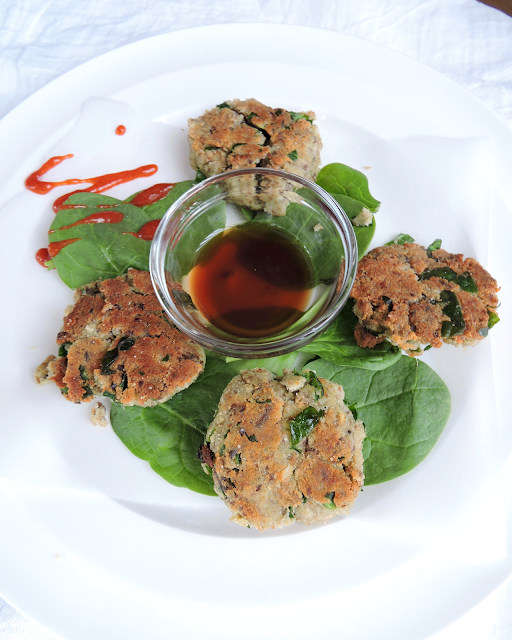 Fry the fritters in coconut oil for 2-3 minutes per side, or until browned. Serve warm dipped in coconut aminos. Hi! I am new to sardines (my natropath recommend I eat them) but, want to try this recipe just not sure what size tin to use. There were several sizes. Thank you!